Whether you love to watch track and field, swimming, gymnastics, or soccer, why not route for our USA Team in style starting August 5th by wearing our OLYMPIC TEAM SPIRIT BRACELET 2016. DaLori Designs has created a winning combination bracelet using 14k gold, beautiful fresh water pearls, and red and blue Swarovski crystals. 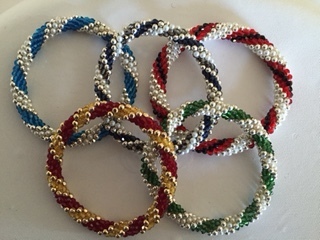 Show your commitment to all our Olympic athletes as well as honor our Veterans who have fought long and hard for our country by purchasing a DaLori Design bracelet! A portion of the proceeds will go to TAPS, a charity that provides comfort and support to families who have lost someone in the military. It's an exciting time to get involved in our country! Let's Go for the Gold with our DaLori Design Team Spirit Olympic 2016 bracelet!